Can anyone recommend good casters for a 2x12 or 4x12 cab? Discussion in 'Amps and Cabs' started by jimmyohio75, Feb 20, 2012. I want to put casters on my new 2x12 cab. Is there a difference in casters? Are some better for this application? 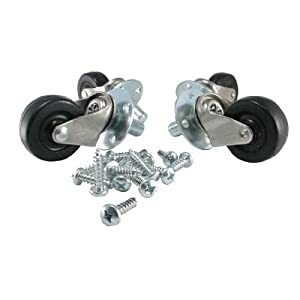 Most of the common "hardware store" casters are pretty junky, and won't roll smoothly over anything. One of the good brands to check-out is Guitel,,they are the standard for road cases, etc., and will be smooth over uneven surfaces. I put the ernie ball pop out casters on my 2x12. I'm sure there's better out there but these are working fine for me right now. The ones that Mesa uses. You can buy them at the Mesa Store. A plate screws on to the cab/amp. The wheels slide into that plate and lock into place. I use the Mesa casters on my Mesa cabs and then get the Ernie Ball casters for other cabs.